Kentucky’s 2019 class now has a quarterback. Nik Scalzo is an atypical recruit that could be the perfect fit for Kentucky. The right-hander from Ft. Lauderdale first entered Kentucky’s radar last summer when Scalzo made the trip to Lexington for a camp at Kroger Field. Undersized with little hype, the 5’11” athlete did just enough to catch Darin Hinshaw’s eye. Between last summer’s camp and today’s commitment, Scalzo threw for more than 2,000 yards and 23 touchdowns, earned 15 scholarship offers and is now considered the No. 16 dual-threat quarterback in America. Eddie Gran has developed a knack for finding talent early in South Florida. It’s what make Kentucky such a coveted destination. “He was one of my first believers,” Scalzo told Justin Rowland after he received an offer at Kentucky’s Junior Day in February. At the time, only a handful of small schools and Ivy Leaguers were interested. Once Gran and Hinshaw got involved, it completely changed Scalzo’s recruiting outlook. The offer from Kentucky all but sealed the deal, until Hinshaw visited Scalzo’s home four days ago. Scalzo has succeeded against some of the best competition the country has to offer. A starter for Cardinal Gibbons since he was a sophomore, the only team Scalzo has not beat is American Heritage, the Power-Five talent producing perennial powerhouse that finished the season ranked in the top five nationally. Scalzo led a tremendous comeback in the final quarter of the Regional Final, but fell to American Heritage in triple overtime to end his junior season. Once the offseason hit, the Kentucky commit found more success on the camp circuit. Last month Scalzo quarterbacked the South Florida Express in the Adidas 7-on-7 Championship in Torrance, California. 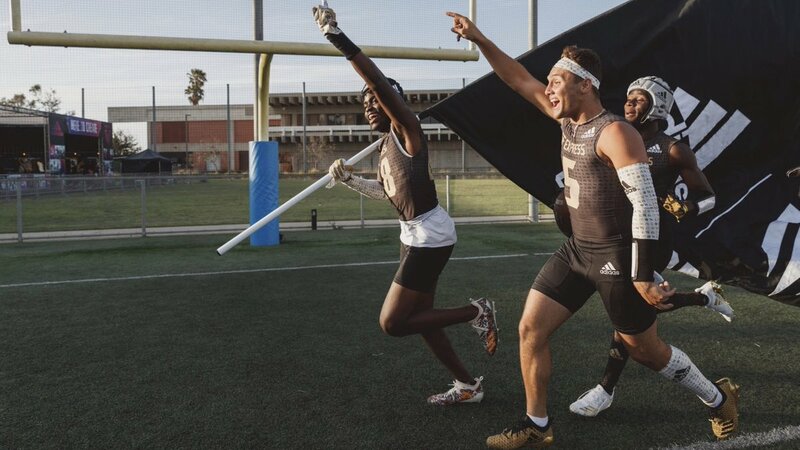 Dubbed by 247’s Steve Wiltfong as “one of the most talented 7-on-7 fields of all-time,” Scalzo threw a 40-yard touchdown in the championship game to bring home a title. It’s not just because he likes to plant flags at midfield after big wins, like he did following the Adidas National Championship. Or because he shares an affinity for headbands. Like Mayfield, Scalzo is an under-sized quarterback that plays with a chip on his shoulder. Teams were hesitant to recruit Scalzo, so he had to work hard to prove to Kentucky that he was worth the scholarship. He did that by using a skill-set that’s similar to the Heisman Trophy winner’s. He runs plenty of RPOs, but is most explosive when he’s moving around in the backfield, slinging the ball to all corners of the football field. Is it fair to compare Scalzo to the Heisman Trophy winner? Probably not, but he embraces and welcomes the comparison (one UK’s coaches use) with open arms. When point guards or quarterbacks commit early, they often pledge to recruit others to join their class. Scalzo does not have to look far to find talented UK recruits. Cardinal Gibbons’ offense features three players who hold UK offers: three-star tight end Nikolas Ognenovic, three-star running back Vincent Davis and three-star offensive lineman Jamari Williams. Ognenovic and Williams are in the middle of a Louisville-Kentucky recruiting battle. Playing with their high school QB at the next level might be just the advantage Kentucky needs. Harvard, Cornell and Dartmouth weren’t recruiting Scalzo because he’s an idiot. Last fall he posted a report card with a 4.92 GPA, a grade-point average that should be impossible. Kentucky fans have been here before. They remember what happened after Mac Jones Tweeted, “We’re building something great.” They also remember when Jarren Williams committed, de-committed, re-committed, then de-committed again. Those were the last two quarterbacks to commit this early in the process. While many will wait to share their excitement until later, Stoops will continue to target quarterbacks early in the recruiting process. Why? Because they kind of have to. Will this be the perfect fit for Scalzo and UK? Only time will tell. If the commit sticks, the Cats have a gunslinger who plays with a chip on his shoulder; the perfect person to lead the SEC’s perennial underdog. 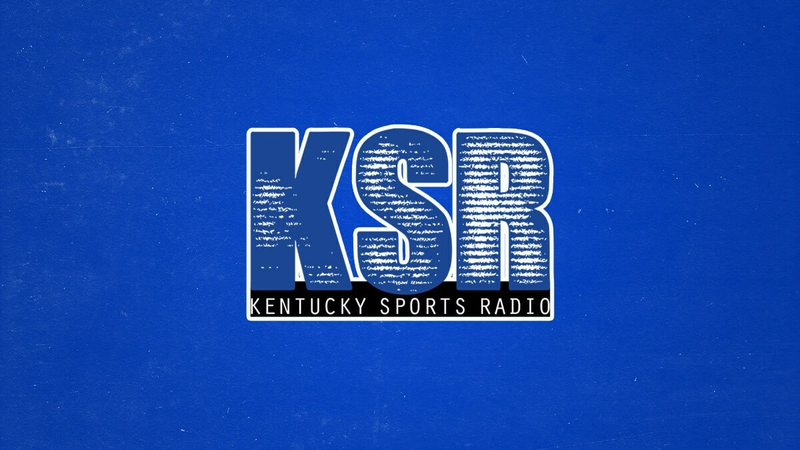 This is one of the most hyperbole filled articles I’ve read on KSR, and that’s saying something. Let’s see if stays committed and can win the job. Your sources also it’s a school night and if you don’t get in bed you’re grounded. Send me a notification when he signs. Mayfield or not this is a good pick up by the Cats. He will start and star. He will? Hope you’re right, but that’s a reach to somehow know that already. Unfortunately, until I see one of our QB’s pan out, I have no faith in this guy. Every year we sign some “hyped” recruit at qb and they never amount to a hill of beans…. Kentucky needs a Johnny Football. At least without the attitude. On a serious note, the kid looks like he has very good accuracy. His highlight video showed he can throw the slant, on the run, or with some touch. I hope he signs with us!!! Also, who are this kids WR’s!? Sign them up too. Damn who’s the WR on his team? #1 looks good lets offer him! I don’t see the Mayfield comparison. More of a right handed Steve Young mixed with Joe Montana, Tom Brady and Barry Sanders running ability. Will he be Mac Jones 2.0? A kid who blows up and gets an offer from a bigger school and goes there. I don’t know where Mac Jones is now but I firmly believe Bama only offered him to keep him from going to UK. They didn’t need him at all. Why do you think Bama did that? Why would they waste a scholarship just to keep one guy away from a school they thrash by 30 every time they play anyway? It’s a way to keep programs in the rise from getting momentum and being more competitive. Keep the small man down kinda thing. Just my opinion. A lot of bama players admitted that last game their depth was the only reason they won like they did. We were the hardest game they played especially in the first half. Good pick up but the problem is UK has never developed a QB under Stoops. The last QB that was truely developed was Woodson. Just find one good leader.